Hey guys! Yes two posts today! This is like the third try of mine doing a Mustache Mani..still don't have it down yet! and I had to add little Monocles to mine! It didn't come out perfect at all, but that is what practice is for! 2012 Milani Spring Illuminating Face Powders in Beauty's Touch, Amber Nectar, & Hermosa Rose. 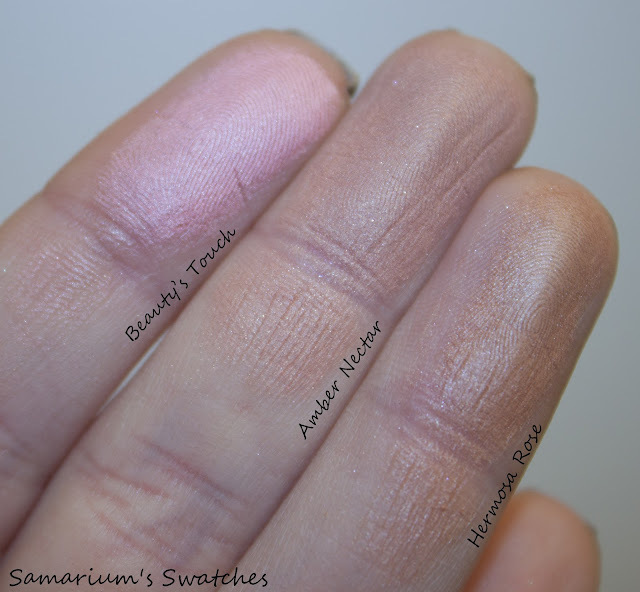 Swatches & Review. I didn't notice any fading or lack of pigmentation throughout the day like I do with a lot of cheek products! They aren't insanely pigmented but I love how they apply, I am always over cautious and worried i will use too much so I appreciate buildable coverage products. These retail for $9.49 ea. for .35 oz. But as you guys know drugstores have coupons and seals all the time so keep an eye out! They are very worth the money imo! The Milani polishes above were sent to me for the purpose of a 100% honest unbiased review. New Milani 2012 Spring Polishes Part 4! & Jewel Fx's! Hey guys! 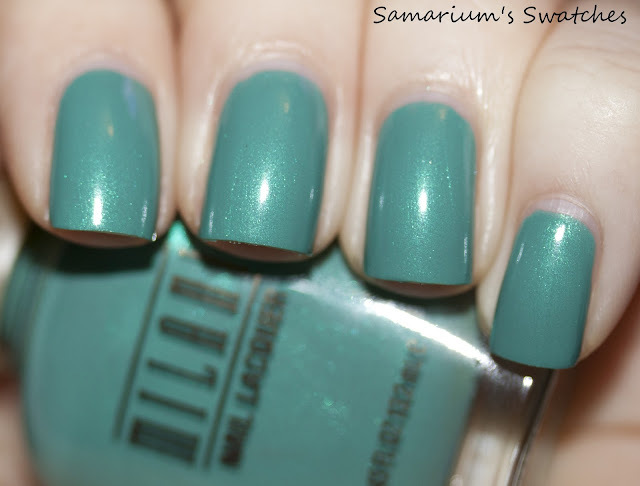 Today I have the final Milani Nail Lacquer post #4 for you! I love these new colors so much and they just make me want to go to the beach! Part 1, 2, & 3!! There are still a couple more Milani posts to come so if you are a huge fangirl for their products like me then be sure to keep an eye out!! From L-R: Milani-Beach Front, Mint Candy, Key West, & Sail Away. Milani-Beach Front, two coats that went on like butter! This makes me wish I was at the beach and not cold atm! Gorg Light blue with silver shimmer! Here is Sail away stamped onto Beach Front, it stamped so great but the polish wasn't 100% dry and wrinkled it a bit, but a lot of these new ones stamp well! Here is Milani-Mint Candy. Not a very Minty color to me but beautiful nonetheless, I love the teal color and green shimmer! The formula was good, it only took 2 coats! This is Milani-Key West, I had a hard time getting a good picture of this polish it seems like it looks more metallic in pictures than irl but it is gorgeous, packed full of shimmer and very shiny! I used three thin coats. I love this color so SO much! Milani-Sail Away is so great! A nice deep blue with shiz tons of silver shimmer! It's basically a one coater but I used two for these pics, plus it stamps!! Grab this one and buy it! Okay and here are the new Jewel FX Polishes! Now these are great but a couple were a little of a pain to work with, just less dense glitter wise than I prefer and took a bit of hassling to get it where I wanted with it. But honestly they are great the only two that were like that were the Red & Hot Pink. I love how shiny they dry! Here is Milani Jewel FX-Hot Pink over Milani Dark Coffee. I love the holo hex glitter! 2 coats! Milani Jewel FX- Lavendar over Beach Front! 1 coat! This is my fav Jewel Fx! I love purple! And the multi-sized glitter! Milani Jewel FX-Teal over Mint Candy! Great combo and LOVE this one too! Multi-sized glitter, plus holo hexes and blue and green! Whats now to love? One coat! Not sure when that will be yet BUT it is coming!! Hope you guys found this helpful! Have a wonderful day!!! Which often do deals for BOGO's so I highly recommend picking up some Milani's if for some reason you haven't already! Hey guys! I wanted to do something colorful! I couldn't choose just a color or so :) So I used a BUNCH! The stamping wasn't sticking much to my nails, so I added a coat of China Glaze Adhesion Base Coat and it worked MUCH better! Unfortunately I didn't think to do that until the left hand : ( Still came out pretty good! Reminds me of Tye Dye! For this mani I used the watercolor technique! Encase You're Interested In My Day! I had a pretty great one! I met a friend for the first time in person who I met in a FB group (a fellow makeup lover!) And we had a girls day in Nashville! We went to Mac, Sephora, and tons of other places! Here are some pics of me and my daughter! And some Awesome Nars samples from the super kind lady who checked me out! I got a bronzer sample, Illuminizer sample & shadow primer sample! Hope you guys had a great day as well!! New 2012 Milani Nail Lacquer shades Part 3! Hey guys! More Milani for you!! 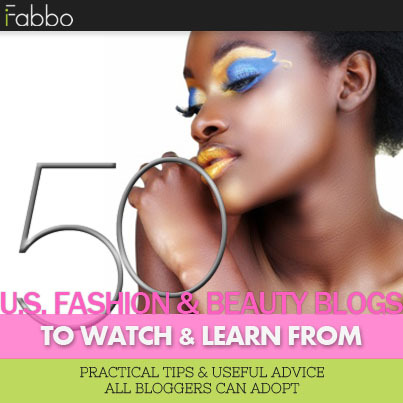 *whew* still 2 more Milani Polish posts coming at you Plus more!! Milani Juno, Orchidia, & Deep Thoughts bottle pics! This purple is so Gorgeous, it appears a bit more blue in photos as hard as I tried to capture it it is a bit more of a red toned purple in person. The formula was great, a bit watery but not where it floods your cuticles or anything at all. It went on Even and Opaque in two coats. I love the silvery white glass fleck glitter! Milano-Juno is a really pretty light pink creme with such subtle shimmer I had a hard time getting it to show! I don't love this color on me and the formula wasn't perfect..It was streaky for me and I used 4 coats to make it fully opaque and streak free. I put two coats of Milani-Deep Thoughts over Juno, and I used some nail striping tape for the accent nail. It is completely opaque on naked nails as well. This is a gorgeous Purple with amazing purple, blue and fuchsia shimmer! The two purples are must haves IMO!! Go buy them :) But seriously they are stand out for me and so gorgeous! Here is a really simple mani, I planned for something more elaborate but I loved this franken so much that I just didn't want to cover very much of it! It is unnamed but absolutely lovely if I do say so myself! I used it over Zoya-Kendall just for the sake of making it last longer but it looks very close to this when used just by using the franken. I used a nail art brush to *try* to draw a heart with black polish, then once dry again with white polish leaving some of the black. Then of the white I used the gorgeous holo HITS-Hestia! Hope you guys liked it, not perfect but I think it is cute! And just because I kind of have to share because I am SO in love with it! Here is my Valentines Day present from my awesome husband!! It's a right hand ring but I look the pictures with my left hand since those nails aren't broken lol! 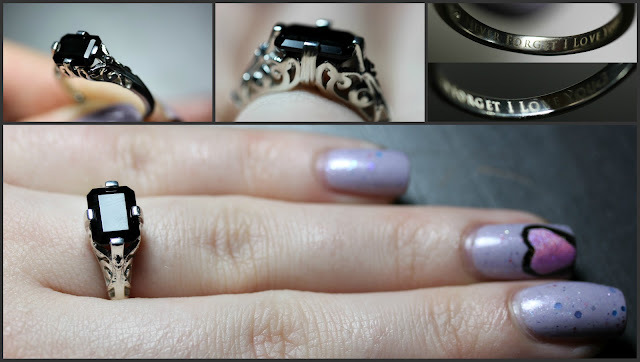 Shout out to Gemvara for making amazing, beautiful, unique elegant jewelry. I highly recommend them! New 2012 Milani Nail Lacquer shades Part 1!